Christmas is almost here! I love decorating the house, making Christmas cookies, and decorating the tree! I mean who doesn’t love the smell of fresh pine lingering throughout the house? At The Rocks Estate, you can cut your own tree down. Cut Your Own will continue every day 10-4 until December 24th. Courteous service – from help cutting and transporting your tree to tying it to your vehicle. Free horse-drawn wagon rides, reserved for package customers until Sunday at 2 p.m. The knowledge that you are helping to support conservation education in the Granite State. A Christmas Memory Package that will create lasting memories and start a great tradition for your family and friends. Can’t make it to The Rocks to pick out your tree? No worries – they’ll ship Christmas right to your door! 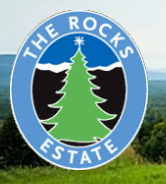 The Rocks happily sends perfectly shaped, fragrant, farm fresh Christmas trees – as well as wreaths, garland, ornaments, and other holiday accessories – anywhere in the United States. Their mail order trees are cut fresh by Forest Society staff at The Rocks Estate, carefully packed in wax-lined cartons to retain that freshness, and shipped via FedEx right to your doorstep. So sit back, relax, and let them send Christmas to you! Sunday Afternoons 2 – 4:00 pm is Locals Day. Discounts on Trees for Local Residents!